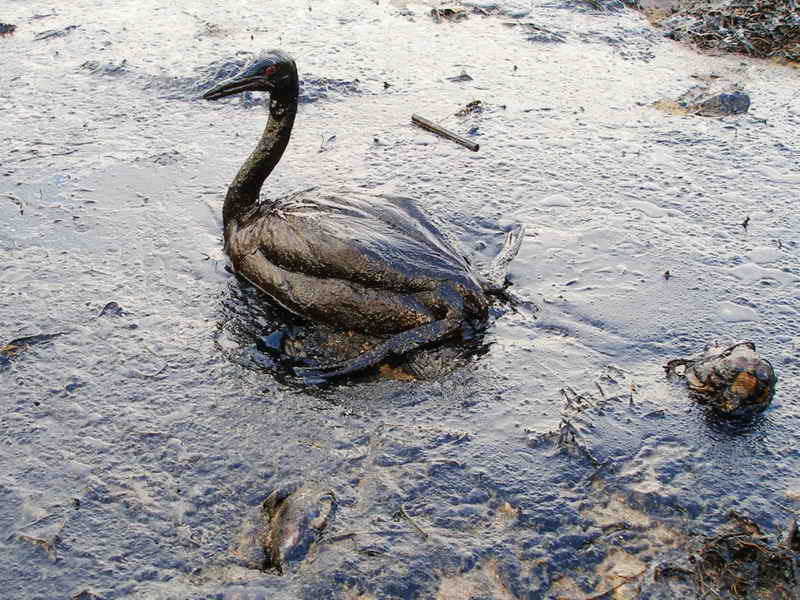 Each year over 500,000 birds die worldwide due to oil spills. The recent BP oil rig disaster or the coast of Louisiana is a major ecological disaster, and the effects have been devastating. Louisiana is the southernmost point on the Mississippi River Flyway. The coastal areas provide a critical link between North American nesting grounds and wintering areas farther south for many migratory birds. Many waterfowl, like ducks and geese, spend their winters along the Louisiana coast. Birds from South America to Alaska will be affected by this spill as they stop to rest and refuel for their northward journey. I have been to Mobile Bay and Dauphin Island in the spring and watched hundreds of thousands of birds pass over or land on the first tree they see after a five hundred mile flight across the gulf from Mexico. The spill also happened at the beginning of the nesting season on the Louisiana coast, so local bird populations will be badly impacted. The most endangered birds are those that depend on the sea for most or all of their food. Storm petrels, boobies, gannets, grebes, tropicbirds, pelicans, cormorants and terns have to pick their food from the top or under the water of the oil soaked sea, ingesting oil products. Those that live along or near the shore such as sandpipers, herons, egrets, coots, rails, gulls, and others end up eating contaminated food as well. When birds get oiled, their outer feathers clump together and are unable to repel water which penetrates the inner down feathers, eliminating their insulating value. They then become hypothermic and die of exposure; some will sink and drown. Birds that do make it to shore are easy prey for predators as they can no longer fly. Trying to preen their feathers, they only ingest more oil. Some birds might be captured and washed, but if they are not rescued in time, some oil products penetrate the skin, poisoning the bird. As of this writing, over 300 birds, 150 sea turtles, and 12 dolphins have been found dead due to the effects of the oil spill. A rule of thumb is that for every dead bird found another four or five died but their bodies not recovered. Even after the spill is no longer visible, the food chain absorbs oil and its various breakdown products, disturbing or destroying large parts of the ecological system. One can only hope that we learn more about safely extracting oil from under the sea, that we are more prepared to address the aftermath of oil spills, and that we reduce our dependence on oil. For our sake and the birds’.